People who came to visit me at Glidden the last couple of days were a bit puzzled to see me standing in the middle of a huge number of weapons. Don't worry, I haven't joined the NRA and I'm still your treehugging and peaceloving Tooter. 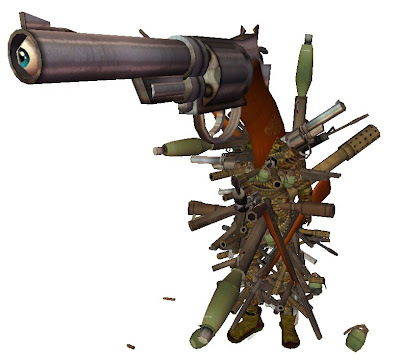 I was making Norman Schwitzkopf (or 'The Negotiator' as Dingle Doigts calls him); an avatar made up entirely of guns, revolvers, pistols, grenades and rpg's. This conflict manager will quickly settle any arguement.